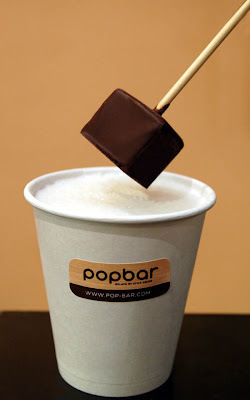 Popbar, the New York based gelato on a stick shop I have posted about before, now offers popbar and miniPop Gelato Stations for events including popologists serving popbars/miniPops in custom trays along with customized menus and Popbar décor. Additionally, they have reintroduced their very popular HOT CHOCOLATE ON A STICK, available in Dark Chocolate and Caramel flavors. New fall delicious flavors including: PUMPKIN PIE popGelato (available until November) and their new delicious array of yogurtPops. Popbar was just featured on the Food Network/Cooking Channel’s ‘Unique Sweets’ show (shown below), Zagat rated them as ‘deliciousness on a stick’, and the highly-acclaimed trade journal ‘Dessert Professional’ just named them one of America’s top 10 frozen dessert retailers for 2011.